The first Earthling in space was not a human. Soviet Cosmonaut Yuri Gagarin was the first human sent into orbit. He was launched on April 12, 1961 onboard the Vostok 1 and spent one hour and 48 minutes in space. However the distinction of being the first Earthling in space goes to Laika (Лайка, "Barker"). She was launched on Sputnik 2 on November 3, 1957. Unlike Gagarin, Laika was sent on a suicide mission. She died during the flight from stress and overheating. At a media conference in Moscow in 1998, Soviet scientist Oleg Gazenko who worked on the project said, "The more time passes, the more I'm sorry about it. We did not learn enough from the mission to justify the death of the dog." On July 2, 1959, a dog named Otvazhnaya (Brave One) was sent into space with her fellow passengers, another dog named Snezhinka (Snowflake) and a rabbit named Marfusha (Little Martha). So by the time the first American, Alan Shepard, flew into space, he had already been preceded by quite a few dogs, some mice and a rabbit. But he also was not the first Earthling sent into space by NASA. That distinction goes to Ham, and Ham was an African-born slave, captured in Cameroon in 1956. 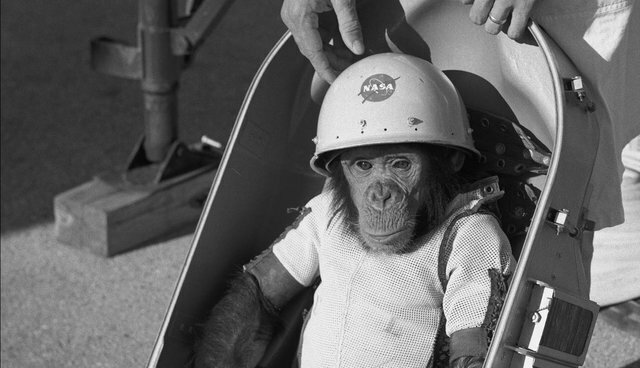 Ham the Astro-Chimp was captured as a baby by animal trappers who had killed his parents. He was then sold to a facility in Florida, where he was purchased by the United States Air Force in 1959. He was one of 40 chimpanzees purchased for space experimentation. He was not given his name, "Ham," until after his flight because the Air Force was worried that there would be adverse publicity should a chimp with a name die during the flight. He was referred to simply as "No. 65," although for some strange reason, his handers called him "Chop Chop Chang." Ham entered space 54 years ago this month on January 31, 1961, in a Project Mercury mission, labeled MR-2, that was launched from Cape Canaveral, Florida. Ham had his vital signs and tasks monitored using computers on Earth. Ham's lever-pushing performance in space demonstrated that tasks could be performed in space. Ham's capsule splashed down in the Atlantic Ocean and was recovered by a rescue ship. He only suffered a bruised nose. His flight was 16 minutes and 39 seconds long. After the flight Ham was sent to the National Zoo in Washington, DC, where he lived for 17 years. He died in 1983 and the plan was to stuff his body for the Smithsonian. That plan was abandoned because of a negative public reaction. Instead, he was buried at the International Space Hall of Fame in New Mexico. On May 5, 1961, Alan Shepard became the first American human to enter space. His flight lasted 15 minutes, and thus, did not surpass the record set by Ham. I remember seeing the picture of Ham on the front page of the newspapers in 1960. I was nine years old. I think my first reaction was that I wanted to become an astronaut. I certainly was not aware nor did it occur to me at the time just how tragic Ham's life had been. But what struck me about the picture was the look of triumph on his face. I think he sensed what he had done. The first hominid to enter space. The first ape from the planet to leave the planet dominated by the cruel humans who had slaughtered his family and enslaved him. For 15 glorious minutes he was free of both the gravitational pull of the planet and his human slave masters. I can't help but wonder now just what he thought when he looked down upon something that only Yuri Gagarin, a few dogs, some mice and a rabbit had previously seen, if they had seen anything at all. I like to think that Ham knew what he was seeing, and that was the same thing that all his fellow astronauts saw after him - that there is but one planet for us all, and upon it, we are all interdependent upon each other.